This is another side road climb to the Ibergeregg (1406m) pass. The earlier and more notable Nühüttli (1664m) starts lower down. Look carefully on the map not to confuse these roads! This is the last asphalted road taking off the Ibergeregg road at Chaltenbrunnen (1216m) from where a narrow and little used road climbs nicely in the woods to the pass, where the views are close to as good as from Nühüttli, but that pass is ultimately nicer. 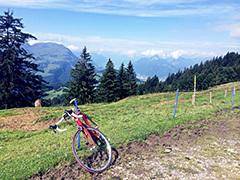 The climb starts in Unteriberg (925m).